NU Honours 1st Year Exam Routine 2017. 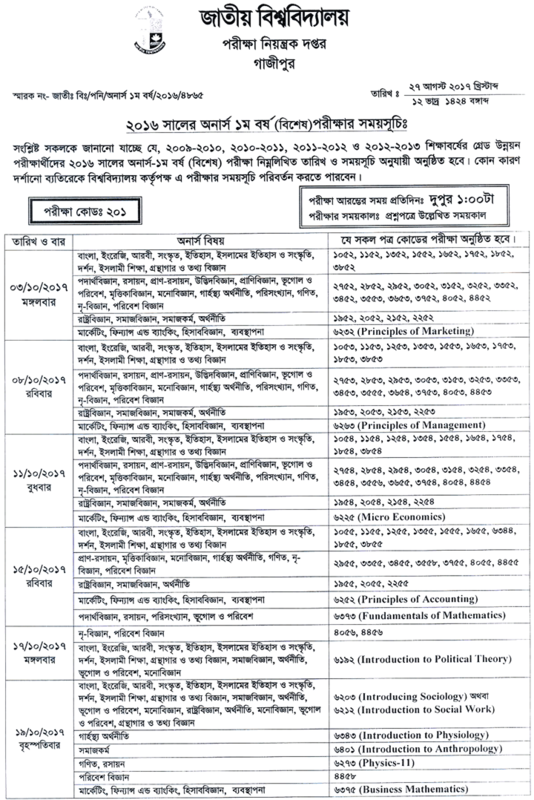 Bangladesh National University Honours First Year Exam Routine, Regular, Admit Card, Form Fill up, In Course 2016-17 session. NU Hons 1st year examination 2017 routine has published recently in NU official website nu.edu.bd. 2017 Honours Regular 1st year exam routine published. national University Honours Part 1 Exam will start from 3 October, 2017. This Exam will start from 1 PM in the afternoon. Without any reason University authorities, can change the schedule. Honours 1st year Regular batch 2016-17 exam will start from 1 November 2017. It will be end in 10th December 2017. You can download full routine from here. You can also download NU Routine in PDF and JPG format from here. Honours 1st year form fill up circular have some rules. If you want to participate in improvement exam, you must be follow the rules below. You must to get D grade minimum 4 subject to admit 1st year.